Get Diverted’s obligatory opening party this year brings Get Physical’s DJ T. to the much revered roof terrace alongside local hero and Lower East label head, Cozzy D.
Thomas Koch aka DJ T. has been a vital part of electronic music and club culture for over 20 years. Uniquely accomplished in both influence and scope, he has excelled in every one of his incarnations: DJ, label owner, producer, club operator, publisher and journalist. His career behind the decks began in Frankfurt, Throughout the 1990s, he was booked at all of the city’s essential clubs, including long lasting residencies at Plastik, Dorian Gray and The Box; by the end of that decade, Frankfurt, one of Europe’s epicentres of electronic dance music, had become indelibly linked with the name ‘DJ T.
T. also founded influential German-language magazine Groove. T.’s intention, which to this day, it remains as one of Germany’s most important publications for electronic music. At the start of the millennium he and friend Patrik Dechent opened Monza, playing a decisive part in it becoming one of the City’s hotspots. In 2002 T. (along with M.A.N.D.Y and Bookashade) set up Get Physical, which is to this day one of the leading Global labels in house and techno. Whether DJing in his hometown of 5 years, Berlin, gigging internationally, T.’s sets are invariably stirring and extraordinarily varied. T. is no style fascist, nor is he a slave to trends; he is a bass- and groove-addicted club historian, with a firm grasp of the contemporary. His sets turn years of electronic music history into one finely rendered journey, making him the perfect choice to mix “Strictly DJ T. – 25 Years of Strictly Rhythm” which is being released in the build up to Get Diverted’s Opening Party. We are excited to welcome back Cozzy D, a Get Diverted favourite having first spun under his Ninja Cowboy’s guise in 2008 and someone whose career has shared the same upward trajectory. Pushing an eclectic taste on deep house and techno, the phrase “forward thinking” is banding around lightly but is very apt to describe his sets. Cozzy runs the highly acclaimed Lower East label and with this and his productions going from strength to strength he is a name that looks set only to grow in reputation and stature. 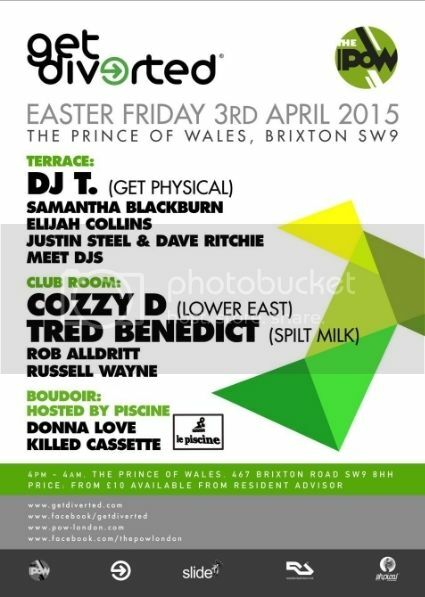 Tred Benedict completes our line up of guests, who you will all be familiar with from his popular Daytime terrace party “Spilt Milk”. Tred is a modern example of the rising talent emerging from the London underground music scene and will be joined by residents Samantha Blackburn, Elijah Collins – so ensure you make your Good Friday a Great Friday with the first terrace party of the summer!